Queer Politics and the Election: What are “Our” issues? 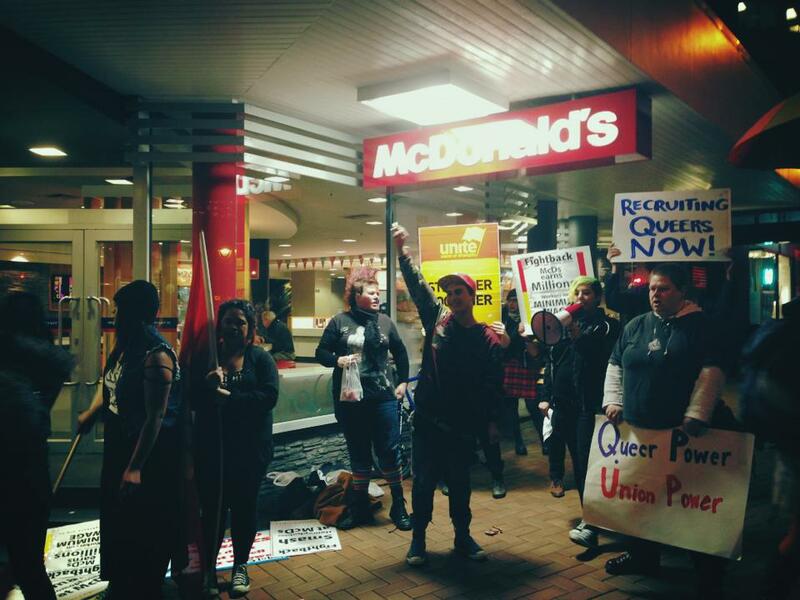 Action in solidarity with queer worker mistreated by McDonalds during 2013 industrial dispute. By Nic Wood, reprinted from Ours. I’m queer. My ideas about what it means to be and belong as a queer person have changed a lot since I ‘came out’ in my teenage years. It’s interesting for me to reflect on this in the context of an election, because the notion of ‘belonging’ is intensified and highly visible in lots of ways in the lead–up to voting day. Belonging is a powerful force. When we belong, we can feel swept up by a kind of euphoria, or simply able to go about life with ease, without having our presence questioned. And when we don’t belong, the consequences are often borne out painfully: as exclusion and discrimination, or even as physical violence. For queer people—that is, lesbians, gays, bisexuals, trans people, intersex people, and the multitude of others whose genders/sexualities appear to be at odds with what’s deemed ‘normal’—belonging holds a particular importance. Our early years are often marked by its absence or denial. This can manifest as the loneliness and fear of being ‘in the closet’, or the extremely noticeable difference of being ‘out’ (sometimes by our own choice, other times unavoidably). I think it’s this sort of beginning which makes the search for and congregation in ‘community’ by queer people all the stronger. If you’ve ever been to a pride parade you may understand what I mean when I say that belonging can ‘sweep you up’; there’s a swell of emotion that comes from the togetherness at such events. I remember the first time I attended one in Wellington, I felt so at home, unlike I ever had around family and friends who’d not known, or liked, my sexuality. It was at once comforting and exhilarating. Who gets to feel included in this euphoria, though? Not everyone. One of the things about belonging and inclusion is that to exist for some people, they rely on the exclusion of others. One could argue that it’s belonging which drives a nation to mobilise to vote, and underpins attempts to secure the vote of those who understand themselves as ‘kiwis’. Belonging, already so important for many queers, is sharply in focus in public discourse at election time. Deciding how to vote, we might look at literal representation: how many ‘out’ queer–identified MPs or candidates are there in each political party? How about how many overtly homophobic and transphobic ones? If we’re concerned with the politics of inclusion—of ensuring that queer people have access to the same conditions as others who are included within the nation—we might consider candidates’ stances on explicitly ‘queer’ policies like marriage and adoption equality, or regulations around service in the military. But you could say this focus on inclusion in what’s ‘normal’ shores up a narrow idea of what a queer person is. This tends to make the experiences of the very narrow selection of queers who benefit from these measures—generally wealthy, white, and more often than not male—appear as universal for everyone. The longer I live openly as a queer person and meet others, the more I realise this is not true; the comfort and ‘at home’-ness I felt in my first pride parade was something many of my friends could enjoy in the same way. And the more my understanding of my sexual orientation matures, the more I question whether things like the right to marry would enable me to live freely, or actually restrict what I want to express. In my mind, the politics of representation and inclusion run the risk of erasing the very difference they purport to speak for. Although that difference can bring us much pain and hardship, it also makes us alive. If we’re to be so wary of all of this, what might ‘our’ important election issues be? It’s hard to say. I do know that far more than we drink fancy cocktails or have lavish gay weddings, queer people—especially youth—are disproportionately affected by poverty. Maybe if we want to vote as queer people we should think about which policies for welfare, housing, access to education and healthcare will benefit those who are currently marginalised, and look into whether there are options which will see organisations who work to support queer and trans youth better supported. While I’m not sure that voting or parliament hold all of the solutions for the complex structures of social power we need to undo to improve our lives, they do influence how much support organisations like the ones mentioned above get to do so within given frameworks. Perhaps instead of getting caught up in the fantasy of ‘gay rights’ which masks a certain kind of harm and exclusion, we might view voting as a pragmatic way to improve, however incrementally, the material conditions of the many queers who don’t get to be the faces of pride parades. In 2012, Colin Craig tweeted that “it’s not intelligent to pretend that homosexual relationships are normal”. In the lead–up to the election, bytes like this have been dredged up by commentators; the ridicule of what many understand as laughably outdated homophobia has become a pretty typical part of political debate as voting day approaches. While it’s important to call out homophobia, the response the statement begs also exemplifies up what I’m so wary about in the crossing-over of possibilities for belonging as queers, and the parliamentary election. In my personal experience voting is just one of many ways to make queer lives more liveable. Above all, we mustn’t settle for ‘normality’ as a goal. There’s too much lost in that.